This space wallpaper shows the Soyuz TMA-08M spacecraft with Expedition 36 Commander Pavel Vinogradov, Flight Engineer Alexander Misurkin and Flight Engineer Chris Cassidy aboard, as it lands near the town of Zhezkazgan, Kazakhstan, on Sept. 11, 2013. This space wallpaper shows the Soyuz TMA-08M spacecraft with Expedition 36 Commander Pavel Vinogradov of the Russian Federal Space Agency (Roscosmos), Flight Engineer Alexander Misurkin of Roscosmos and Flight Engineer Chris Cassidy of NASA aboard, is it lands in a remote area near the town of Zhezkazgan, Kazakhstan, on Wednesday, Sept. 11, 2013. 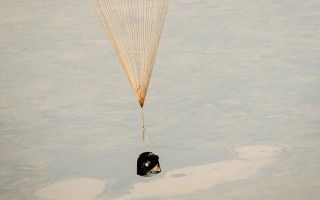 Vinogradov, Misurkin and Cassidy returned to Earth after five and a half months on the International Space Station.